Small Beer Press, 9781618730862, 398pp. Chosen for the 2016 Silicon Valley Reads program. It was morning and the power was not yet on. Zach and Renee lay in the heat of the bed listening to the city wake outside the building's windows. In drought-stricken Portland, Oregon, a Robin Hood-esque water thief is caught on camera redistributing an illegal truckload of water to those in need. Nicknamed Maid Marian--real name: Renee, a twenty-something barista and eternal part-time college student--she is an instant folk hero. Renee rides her swelling popularity and the public's disgust at how the city has abandoned its people, raises an army . . . and secedes a quarter of the city. Even as Maid Marian and her compatriots build their community one neighbor at a time, they are making powerful enemies amongst the city government and the National Guard. Sherwood is an idealistic dream too soon caught in a brutal fight for survival. 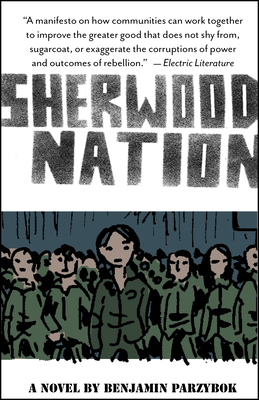 Sherwood Nation is the story of the rise and fall of a micronation within a city. It is a love story, a war story, a grand social experiment, a treatise on hacking and remaking government, on freedom and necessity, on individualism and community. Benjamin Parzybok is the author of the novel Couch and has been the creator/co-creator of many other projects, including Gumball Poetry, The Black Magic Insurance Agency (city-wide, one night alternate reality game), and Project Hamad. He lives in Portland with the artist Laura Moulton and their two kids. He blogs at secret.ideacog.net. Benjamin Parzybok is the author of the novel Couch, and has been the creator/co-creator of many other projects, including Gumball Poetry (literary journal published in capsule machines), The Black Magic Insurance Agency (city-wide, one night alternate reality game), and Project Hamad (an effort to free a Guantanamo inmate and shed light on Habeas Corpus). He lives in Portland with the artist Laura Moulton and their two kids. He can be found online at levinofearth.com.